Weekend Reading: Anchor + Pumpkin from the Samhain Vintage Lenormand by Seven Stars. 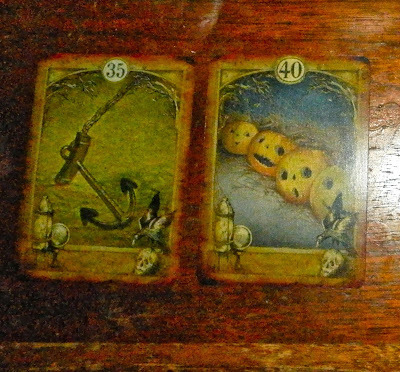 In this deck, Pumpkin is one of four extra cards and it means prosperity or enchantment. So this weekend's fortune is literally "prosperous stability". This could mean you're feeling financially secure this weekend. Or maybe it means you make a very practical decision about money this weekend. Or it could indicate that any prosperity you have will be hanging around for a while. But whatever it is, it's good news. With many people worrying about their livelihood this weekend due to the government shutdown, it may provide some hope that, no matter how things look, it's all going to be ok. I know in one case someone's boss is allowing their furloughed employees to use all their sick and vacation days during the shutdown so they'll still get a paycheck for this time. That would be a perfect example of Anchor and Pumpkin at work! Oh, I'll be feeling flush when my copy of this deck arrives ;) In the meantime, from your keyboard to the ears of the Goddess, sending good thoughts to those folks worried for their livelihoods!